As an ageing population, we will make more presentations to our GPS, specialists and hospitals than ever before. Charmaine Jones explains how advocates can help us understand and navigate the health system. Unfortunately, some lessons have to be learnt the hard way. As I did a couple of years ago; in a case of medical misadventure, a broken bone which should have resulted in an operation and six weeks in plaster became a two year nightmare consisting of many hours spent in waiting rooms, 46 x-rays, three operations and a lot of pain. This situation arose because I didn’t push hard enough or interrogate the responses my medical professionals were providing. There were a couple of reasons for this. Firstly, I was in a lot of pain and was heavily medicated. I felt vulnerable and my thought processes weren’t as sharp as they would usually be. Secondly, the power imbalance between doctor and patient is large, we lay trust in our medical practitioners, holding the belief they will always act in our best interests. Add to this the language of medicine, which, rather like legalese, can baffle and addle the clearest of minds. So, when overworked, inexperienced interns told me I was fine and everything was as should be expected, I would sit in mute silence, unable to find the words to counter what they were saying, despite knowing what they said was incorrect. The whole affair, while quite traumatising, was also rather embarrassing. As someone who spends their working life advocating on behalf of other people, on this particular occasion, I was unable to effectively advocate for myself. 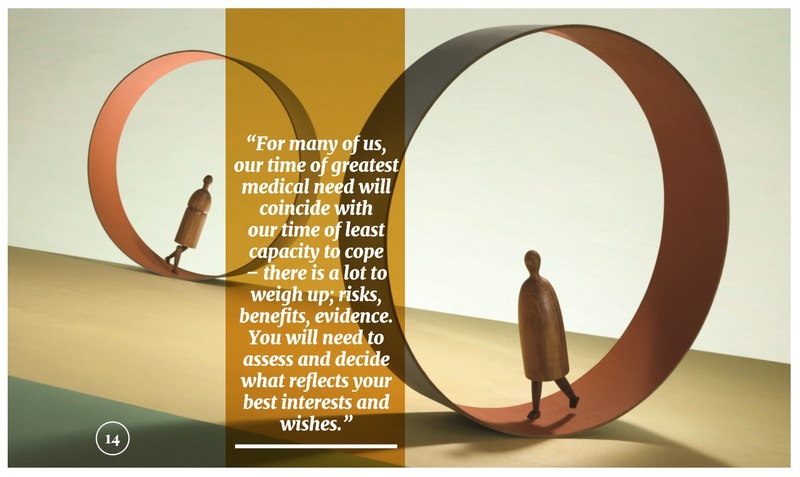 For many of us, our time of greatest medical need will coincide with our time of least capacity to cope – there is a lot to weigh up; risks, benefits, evidence. You will need to assess and decide what reflects your best interests and wishes. And, as with any big life decisions, a problem shared is a problem halved. An individual patient advocate will act as a clinical liaison. They are usually a paid worker, with medical experience, who will walk beside you and help plot your course through the health system. They will attend appointments with you, research treatment options, explain technical medical lingo and ensure your rights as a client are being met. Whilst it would be great if we could all afford a private clinically trained advocate, it isn’t absolutely necessary. Anyone can be your advocate– your friend, your carer, a family member, a volunteer from a local support service can all provide the same service. At appointments, they can take notes so you can reread what the doctor spoke about at a time when you are maybe more readily able to digest the information, they can help follow up on any questions you may have had, they can do research, they can synthesise information in a way that you, due to your vulnerabilities, cannot. Part of the reason that makes having an advocate on side a sensible option is that we have allowed our medical system to shift from advice giving to decision making. A good physician should present you with treatment options, outline the risks and benefits and ensure you are informed enough to make a decision yourself. Yet, we see less and less of this and even when we do, it can be difficult not to look to your doctor to make the decision for you, especially if you have just received bad medical news. The benefits of an independent person, who will have spent more time learning to understand you, your lifestyle, and your preferences, are clear. They can assist you to understand your options and also to identify medical biases. Many studies show medical practitioners practice with bias. Surgeons are more likely to recommend surgery, radiologist more likely to recommend radiology, regardless of the patient’s needs or the probable outcome. Medicos can also have cognitive biases including focusing on one symptom or diagnosis and failing to consider other possibilities, uncritical acceptance of an initial diagnosis, and calling off the search when just one abnormality has been found. An advocate can assist in probing the doctor’s thinking and ensure these types of bias are not skewing diagnoses and/or treatment options. In Inner Sydney, community services funded to provide individual social support can provide workers or volunteers to attend appointments with patients. The system itself can be overwhelming and access can be difficult. If you fit the eligibility criteria, they can arrange for a volunteer to assist in finding your way around hospitals and large medical complexes and with your permission they may sit in on the consultation and act as a filter between you and the consultant and can communicate information back to family and carers. Patient advocates do not, and should not, make medical or any other decisions for you. Their role, whether paid or volunteer, is to ensure that you, the patient, are as well-informed as possible and prepared to make the best decisions about your treatment. Ultimately, we are the ones who understand our bodies and minds the best. And doctors like well-informed patients. In the health area the internet brings both dangers and opportunities for accessing helpful information. Many of us might be guilty of using “Dr Google” to investigate our symptoms rather than going to a doctor. Self-diagnosis by the internet is dangerous and you should visit a medical professional who is trained in sorting out what is relevant in making a diagnosis. On the other hand if you do have a diagnosis the internet can be very useful in finding out more about that diagnosis, treatment options and for putting you in contact with others that might be able to help. Organisations or groups set up with a focus on your health condition can often help you better understand an illness, treatment options and research initiatives. There may be opportunities through such organisation, friends or social networks to speak to people who have the same problem or who have undergone the treatment you are considering. All of this can be useful in developing your understanding of a diagnosis and treatment options. Such networks can also offer a degree of compassion and understanding that may be missing from the sterile, clinical world of treatment. It is like having access to hundreds of advocates, who can ensure you some good, if not great, advice. Care needs to be taken however to make sure you are using information from reliable sources. Anyone can put up information on the internet or tell you something but it does not mean it is true! After you have done your reading it is always a good idea to discuss what you have found with your doctor or to seek a second opinion if you are concerned your doctor may not have got the diagnosis correct. Hugh, T.G., Tracy, G.D., “Hindsight bias in medicolegal expert reports,” Medical Journal of Australia (2002) Vol. 176, no.6. p.277-278.